This image shows two young brown dwarfs, objects that fall somewhere between planets and stars in terms of their temperature and mass. Here we see a long sought-after view of these very young objects, labeled as A and B, which appear as closely-spaced purple-blue and orange-white dots at the very center of this image. A class of cosmic oddballs exists that doesn't fit in witheither stars or planets, instead occupying a murky middle ground. Known as brown dwarfs, these misfits fall somewhere betweenplanets and stars in terms of their temperature and mass. They arecooler and more lightweight than stars and more massive (and normallywarmer) than planets. This has generated a debate among astronomers: Do browndwarfs form like planets or like stars? Scientists now have an additional clue ? 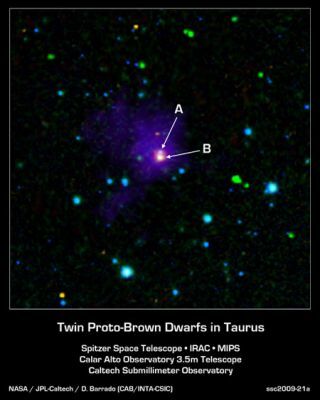 a baby brown dwarfwas discovered by NASA's SpitzerSpace Telescope ? that suggests brown dwarfs develop like light-weightstars. Brown dwarfs are born of the same dense, dusty clouds thatspawn stars and planets. But while they may share the same galactic nursery,brown dwarfs are often called ?failed? stars because they lack the mass oftheir hotter, brighter stellar siblings. Without that mass, the gas at their core does not get hotenough to trigger the thermonuclear fusion that burns hydrogen ? the maincomponent of these molecular clouds ? into helium. Unable to ignite as stars,brown dwarfs end up as cooler, less luminous objects that are more difficult todetect ? a challenge that was overcome in this case by Spitzer?s heat-sensitiveinfraredvision. To complicate matters, young brown dwarfs evolve rapidly,making it difficult to catch them when they are first born. The first brown dwarf was discovered in 1995, and whilehundreds have been found since, astronomers had not been able to unambiguouslyfind them in their earliest stages of formation until now. In this study, an international team of astronomers found aso-called ?proto brown dwarf? while it was still hidden in its natal star-formingregion. Guided by Spitzer data collected in 2005, they focused their search inthe dark cloud Barnard 213, a region of the Taurus-Auriga complex well known toastronomers as a hunting ground for young cosmic objects. "We decided to go several steps back in the processwhen (brown dwarfs) are really hidden," said David Barrado of the Centrode Astrobiologia in Madrid, Spain, lead author of the paper detailing thediscovery in the Astronomy & Astrophysics journal. "During this stepthey would have an (opaque) envelope, a cocoon, and they would be easier toidentify due to their strong infrared excesses. We have used this property toidentify them. This is where Spitzer plays an important role because Spitzercan have a look inside these clouds." Spitzer?s longer-wavelength infrared camera penetrated thedusty natal cloud to observe a baby brown dwarf named SSTB213 J041757. Thedata, confirmed with near-infrared imaging from Calar Alto Observatory in Spain, revealed not one but two of what would potentially prove to be the faintest andcoolest brown dwarfs ever observed. They're also the youngest, the astronomersthink. To pin down that the dusty envelope was in fact a celestialwomb and that these dwarfs were in their infancy, Barrado and his team had themobserved from around the world. The information gleaned from these observationshelped the astronomers characterize the brown dwarfs and the environment aroundthem. "We were able to estimate that these two objects arethe faintest and coolest discovered so far," Barrado said. The observations suggest brown dwarfs form like low-massstars. This theory is bolstered because the change in brightness of the objectsat various wavelengths of light matches that of other very young, low-massstars. While further study will confirm whether these two celestialobjects are in fact proto brown dwarfs, they are the best candidates so far,Barrado said.